Love & Bones Broth is a delicious, nutrient rich, healing, flavorsome liquid made with only the best quality seasonal organic ingredients and stacks of LOVE! Even though we aren’t certified organic we only use ORGANIC produce, including veggies, organic chicken bones, Organic grass fed beef bones. That’s pretty much it - just the very best ingredients cooked in filtered with unrefined sea salt and organic black pepper. Our broth is simmered on the lowest possible heat for 24 to 36 hours to extract all the goodness and preserve its high nutritional value. We promise it’s the most delicious broth you’ll ever taste anywhere in the world! 1.Why should you drink me? I’m incredibly nourishing and restorative and packed with loads of essential vitamins and minerals. Live by the motto. ‘A cup of broth a day, keeps the doctor away!’ There’s a reason you make for your loved ones because I’m the one thing that soothes the soul along with many many ailments. I’m super hydrating and aid in weight management, drink me every single day for glowy beautiful skin. 2. When should you drink me? Anytime of the day! Drink me as part of your meals to help you better absorb other nutrients and minerals not only found in me but also in the food you’re eating. Drink me instead of a cup of coffee of tea or even as a night cap. Your kids should drink me every single day with our exception. As part of their dinner, in their dinner or even as their dessert - no exceptions! Set them up for a life of little illness now! 3. Can I aid food digestion? Absolutely! Drunk alone, or in conjunction with your meal, Love & Bones Broth will help you digest your food and better absorb the goodness that you would naturally expect to be getting from an organic, wholefoods diet. Unfortunately, however, many of us have absorption issues because of myriad gut/health issues, which is where Love & Bones Broth helps by not only breaking down proteins and enzymes found in other foods, but also by boosting digestive enzymes to aid the absorption process of the broth. If you have any gut issues we suggest you speak to your health practitioner for proper advice and drink us while you do. 4. What else am I good for? I’m high in natural collagen, healthy youthful skin requires collagen instead of spending a fortune at the beautician getting god knows what synthetics injected into your skin drink Love and Bones Broth everyday and reap the rewards inside and outside your body. Had a big night, need to recover? I am full of glycine. This amino acid may also protect your liver after to much alcohol and will also improve your sleep quality (bonus) and heart health. Pregnancy, pre, during and post. I am the super elixir for any mum to be or new mum and then bub gets all the benefits until he or she is ready to start having it themselves. 5. How often should I drink you? As we said, ‘A cup of broth a day, keeps the doctor away.’ The more the better for you. 6. 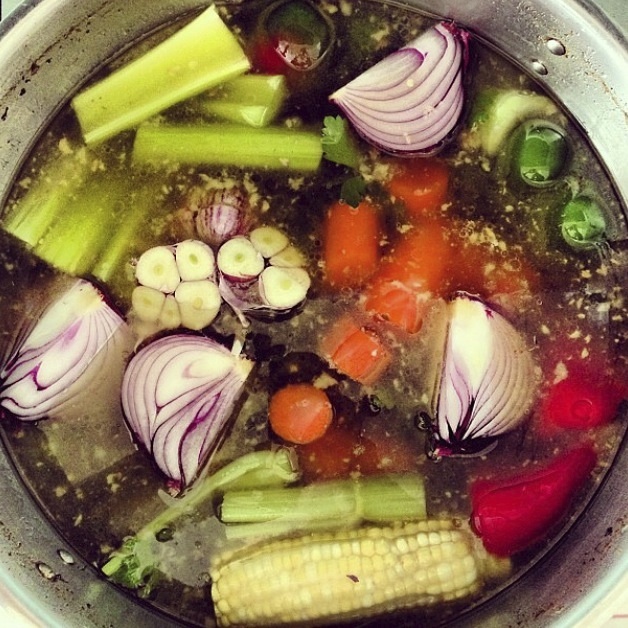 Is is safe to do a Broth Cleanse? Yes, it is. As long as it’s practitioner approved or you’ve done due diligence researching it yourself. I’m great as part of a fasting mimicking diet and we suggest all fasting be taken slowly, so over the weekend to begin and then once you’ve seen how you go stretching it from 2/3 days to 5 days. Please contact someone at Love and Bones Broth if you’d like to know more. 7. How do I heat you so as not to destroy your goodness? Simply empty the contents of your Love & Bones Broth jar into a saucepan and add half a cup of extra filtered water into the jar (so as not to waste a single drop) give it a good shake and empty the additional water into the saucepan too. Gently bring me to the boil and then take me straight off the flame. I like to stand and cool for a minute before you taste test me and check seasoning. 8. How else can you use me? You can use me instead of water for cooking vegetables, rice or pasta for simple kids meals. I’m also a great base for other delicious soups or stews, and you can even sauté potatoes or meat in me for slow cooked deliciousness. Or just serve me up as is! 9.How can I make you healthier? Traditionally bone broths were made for people recovering from bouts of illness or those in need of extra immune support. I’m a great, all-round health elixir and especially good for new mums, recovering from childbirth, and in preparation for feeding their new infants. Adding vegetables to me and extra healthy fats but I’m pretty perfect just the way I am! 10. Is there a folk law surrounding broth? That a good broth can resurrect the dead? I’m not sure about the latter, however, Bone Broth has been traditionally used for thousands of years, across various countries and cultures for its restorative and healing powers. You may have heard of names such as ‘Jewish Penicillin’, ‘Golden Elixir’ and 'Brodo', well they’re just some of the names given to the wonder liquid that is Bone Broth over the years. We believe it’s that good for you!